Phoenix 1.4 is on it’s way and one of the big changes is that webpack is replacing brunch. If you are a SASS fan then this is how to update the default Webpack configuration to use SASS (SCSS flavour). The first step is to install the node-sass and sass-loader packages from NPM. Update the assets/webpack.config.js file with a change to chain the sass-loader plugin after the css-loader. Rename your assets/css/app.css to assets/css/app.scss. // We need to import the CSS so that webpack will load it. // its own CSS file. Finally test your assets build. With Phoenix 1.4 announced at ElixirConf EU (https://youtu.be/MTT1Jl4Fs-E) I was keen to try it out. I was specifically interested in seeing the new Webpack integration. Getting started with Phoenix 1.4 is really quite easy. Remove any previously installed phx_new archives so that Mix will pick up the local source code. This can be done with mix archive.uninstall phx_new or by simply deleting the file, which is usually in ~/.mix/archives/. Reverting to the 1.3 installer is as easy as uninstalling and reinstalling the Phoenix archive. Appending to a list in Elixir ( ++ ) is slower than prepending and reversing [ 2 |  ] |> Enum.reverse but how bad is it? Benchfella benchmarks work similarly to tests. Create a directory named bench and then create a file ending in _bench.exs. Benchfella will find these files and run them. Create a file bench/list_append_bench.exs We will write our functions in the bench file but you can reference functions in another module to benchmark your project code. This benchmark will test three different ways to build a list, (1) append each element to the list using ++, (2) build up the list using a recursive tail where the element is added to the head but the tail is built up recursively, and (3) prepending the element to a list accumulator and then reversing the list at the end. The results: prepending to a list and reversing it is 200 times faster than appending and only fractionally faster than building the tail recursively. For more complex benchmarks, Benchfella has various hooks for test setup and teardown. It also has ability to compare benchmark runs with mix bench.cmp and graph the results with mix bench.graph. Sometimes, when you want complete control, you want to be able to install packages from source and still use an automated tool like Ansible to do that. A simple set of tasks can check for the existence of files to eliminate the need for running tasks that are already complete but that doesn’t help us with making sure we have the correct version installed. A first pass can be found in this gist If repeated, this build will re-download the archive, extract it, configure it and make it. It won’t install the binary again because it checks for the existence of the file /usr/local/bin/ruby but other than that, all tasks will re-run. The first step is to create a task that will determine the installed ruby version if present. This task will run ruby --version but will silently fail if ruby is not installed. If ruby is installed, then it registers the version string in a variable named ruby_installed_version. The next step is to create a variable we can use to test whether to build ruby or not. This is set in our global_vars to a default of false. Then add a task that will set that variable to true if the version string doesn’t match. The when clause checks for two things, (1) the task which checked the ruby version failed (i.e. there is no ruby installed) or (2) the ruby_reinstall_from_source variable is true (i.e. the versions don’t match). We now have a conditional on every test. That seems a bit redundant. This can be improved by using the block syntax. By using a block we can check the condition once, and then run or skip the whole installation in one move. The final code can be found in this gist, https://gist.github.com/andrewtimberlake/802bd8d285b3e18c5ebe, where you can walk through the three revisions as outlined in the article. Whenever is a great gem for managing cron jobs. Dead Man’s Snitch is a fantastic and useful tool for making sure those cron jobs actually run when they should. Whenever includes a number of predefined job types which can be overridden to include snitch support. The job_type command allows you to register a job type. It takes a name and a string representing the command. Within the command string, anything that begins with : is replaced with the value from the jobs options hash. Sounds complicated but is in fact quite easy. This will create a file, config/schedule.rb. Insert these lines at the top of your config file, I have mine just below set :output. These lines add && curl https://nosnch.in/:snitch to each job type just before :output. job_type :command,   "cd :path && :task && curl https://nosnch.in/:snitch :output"
job_type :rake,      "cd :path && :environment_variable=:environment bin/rake :task --silent && curl https://nosnch.in/:snitch :output"
job_type :runner,    "cd :path && bin/rails runner -e :environment ':task' && curl https://nosnch.in/:snitch :output"
job_type :script,    "cd :path && :environment_variable=:environment bundle exec script/:task && curl https://nosnch.in/:snitch :output"
Now it’s time to create the snitch. You can grab a free account at deadmanssnitch.com and add a new snitch. Then, once that’s saved, you’ll see a screen with your snitch URL. All you need to do is copy the hex code at the end. Now deploy and update your whenverized cron job. DMS will let you know as soon as your job runs for the first time so you know it has begun to work. After that, they’ll only let you know if it fails to check in. I’ve found a number of times where I have needed to iterate over a hash and modify the values. The most recent was stripping excess spaces from the values of a Rails params hash. 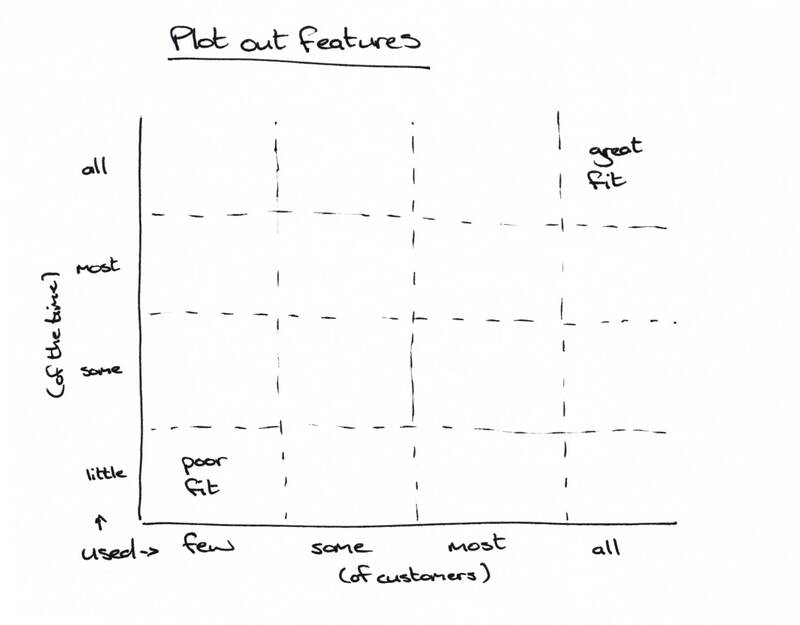 I quickly drew out the graph from the video on determining great feature fit. What you're looking for is features that will be used by all your users all of the time. I use a large 27" iMac which I divide up windows with a browser in the top right of the screen. One thing that often frustrated me is that I could not maximise a video to fill the window completely. I had to fill my entire screen or watch it in the embedded size.